Although humans have been around for 200,000 years, they didn't develop the makings of modern society -- culture, art and advanced tools -- until about 50,000 years ago. Could lower testosterone levels have helped make the difference? 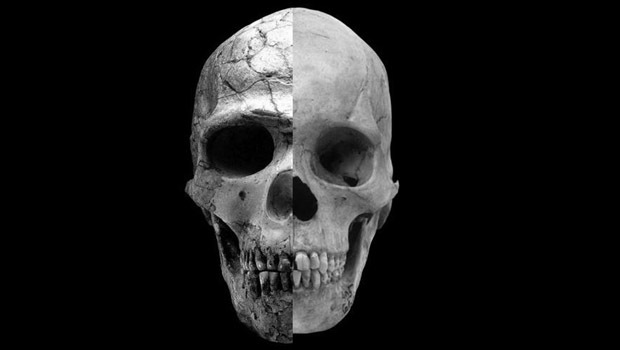 A study published in the journal Current Anthropology finds that human skulls changed shape at about that same point in time -- physical changes linked to declining testosterone levels. The researchers say that suggests lower levels of the male hormone could have helped bring about modern civilization. "The modern human behaviors of technological innovation, making art and rapid cultural exchange probably came at the same time that we developed a more cooperative temperament," lead author Robert Cieri, a biology graduate student at the University of Utah, said in a press release. The research is based on measurements of the skulls of more than 1,400 modern and ancient humans. Begun as a senior thesis at Duke University, Cieri's research compares the brow ridge, facial shape and interior volume of 13 human skulls order than 80,000 years old; 41 skulls from 10,000 to 38,000 years ago; and more than 1,000 20th century skulls. A reduction of the brow ridge and a shortening of the upper face became apparent over time. The changes in the skull structures -- heavy brows being replaced with rounder heads -- are evidence of decreasing testosterone levels acting on the skeleton, Cieri says. Similar changes have been seen in animals. In a study with Siberian foxes, animals that were less wary and less aggressive toward humans developed a more juvenile appearance and behavior. Around 50,000 years ago, humans underwent a drastic change, producing tools out of bone and antler, making projectile weapons and showing command of fire. Cieri argues that living together and cooperating rewarded lower aggression, allowing for societies to develop. "If prehistoric people began living closer together and passing down new technologies, they'd have to be tolerant of each other," he explained. "The key to our success is the ability to cooperate and get along and learn from one another."